The first part of today’s walk was across the bleak moorland of Torver Common. This was a particularly enjoyable part of the journey - although only at a low altitude, it felt very remote and quite wild. There were good views looking back to the mountains of the Lake District, particularly of Dow Crag and The Old Man of Coniston. We stopped for our ‘elevenses’ at Beacon Tarn, in the middle of the moorland. 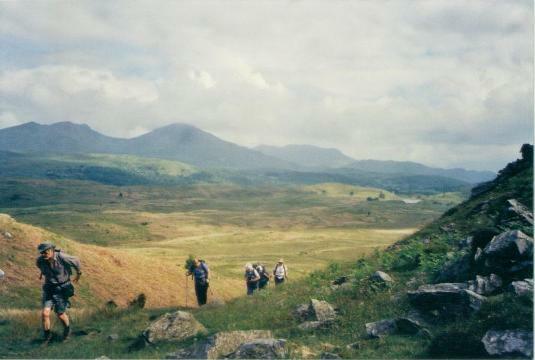 The scenery gradually became less wild as the moorland began to give way to more pastoral surroundings. We stopped for lunch by some rocky outcrops in a grassy meadow near Gawthwaite, before progressing on through more farmland. We soon had views of the monument on Hoad Hill, overlooking Ulverston, so we knew our destination was not too far off. We had another short break in the churchyard at Osmotherly, before following more field paths all the way to Ulverston. A passing local lady kindly agreed to take our photos at the finishing point, a strange modern sculpture by a car park. We then wandered through the town, visiting the tourist office, before a celebration drink at one of the pubs in town. This very brief description indicates that there were not too many memorable incidents or places of interest on this final day. But it was very pleasurable walk, and certainly far nicer than our opening day. I think we all agreed that we were glad to have done the Cumbria Way in the direction that we had.